A beautiful late 19th century French white Carrara marble of a woman and her Mandolin Signed Paul Fournier Paul Fournier (French, 1859–1926), made many full size and busts of women in the late 19th century. His works are rare and remain difficult to find. 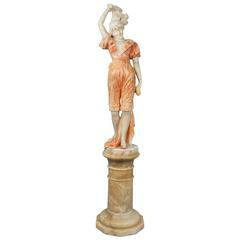 Sculpture Height: 40 inches / 102cm Width: 14 inches / 36cm Depth: 11 inches / 28cm Pedestal Height: 38 inches / 97cm. A pair of late 19th century bronze busts By A. Mahuex Depicting busts of young boys sitting on a black marble base.